Events honoring the bicentennial of the War of 1812 began in June of last year and will continue through February 16, 2015—the anniversary of the Senate ratification of the Treaty of Ghent. 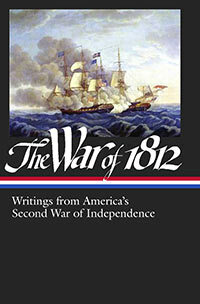 To coincide with the 32-month series of commemorations, The Library of America has just issued The War of 1812: Writings from America’s Second War of Independence, a collection of eyewitness accounts and historical documents about our nation’s first declared war. One of the remarkable things about the War of 1812 at sea (and on the Great Lakes) was how well the youthful U.S. Navy performed against the reputedly omnipotent Royal Navy. No one expected much from a navy that was outnumbered by a ratio of fifty to one. President James Madison claimed the war was about freedom of the seas, but in reality he was more concerned with expanding America’s frontiers and winning the 1812 election, then only months away. The wars against the Barbary pirates during the administration of Thomas Jefferson had served as an incomparable school for young American officers. . . . At that time, American crews were composed entirely of volunteers—their counterparts in the Royal Navy were, by contrast, virtually maritime slaves. Moses Smith was one such volunteer. By the time of the famed battle between the USS Constitution (“Old Ironsides”) and the British frigate Guerrière, the 29-year-old sailor had been on the American ship for a year; his responsibility during the 35-minute battle was to sponge out cannons between firings. Early in Smith’s gripping narrative describing the encounter, he refers to a sea battle known as the Little Belt Affair—one of many events that led to the war. Two months earlier Guerrière had stopped a U.S. ship and detained a member of its crew. Incensed, the commander of another American ship, President, decided to track down the offending ship and encountered instead the much smaller sloop-of-war Little Belt. Accounts differ as to who fired the first shot, but, no match for the frigate President, the British ship sustained heavy damage, with nine dead and twenty-three wounded. The unequal contest became a rallying cry for the British navy during the war. Having learned which way the Guerriere was steering when last seen, we crowded all sail in that direction. We steered a north-east course for several hours, until the morning of the 19th of August, 1812. This was the day of the battle. . . . If you don't see the full selection below, click here (PDF) or click here (Google Docs) to read it—free! C. S. Forester never said it better: from his novel "Hornblower Takes Command" -- “There was nothing to be seen at all, nothing save darkness and the faint glimmer of the wave crests…’Sunk, by God!’ exclaimed Bush, leaning out over the rail."